An easy fruit salsa recipe for chips, tacos, or on top of chicken, fish, and more. 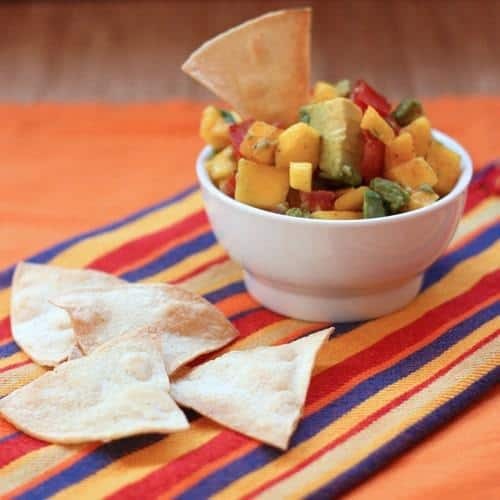 Mango Avocado Salsa is sweet and tangy, with just a hint of spice, and no raw onions or jalapenos, making it totally a kid-friendly dip. This quick and easy recipe for fruit salsa is perfect with fish tacos, or on top of grilled chicken or steak, or as a gluten free appetizer with some tortilla chips for dipping. 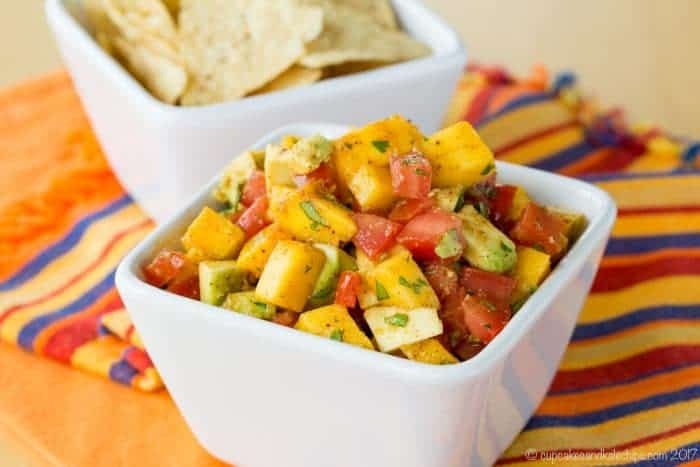 This healthy mango avocado salsa is also vegan and paleo, and makes a fantastic gluten-free Cinco de Mayo food! 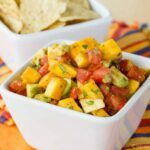 How do you make Mango Avocado Salsa? 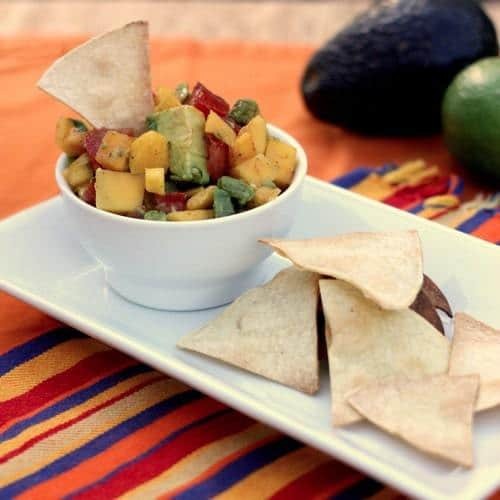 This Mango Avocado Salsa recipe couldn’t be easier to make. There’s isn’t much more to it than chopping, mixing, and squeezing a lime, plus you’ll find tips and gadget recommendations below and in this recipe video that make it even easier. If you have time, you can let it sit in the fridge a bit. But in just minutes you have a sweet, slightly spicy, tangy, and fresh dip or topping that’s healthy, gluten free, vegan, paleo – the whole nine yards. And it’s totally kid-approved! As long as my kids aren’t just being stubborn or just being finicky, I typically try to respect their true food dislikes. The big one won’t eat tomatoes. The little one won’t eat avocado. But they both LOVE mango. Years ago, I made mango avocado salsa all the time, but I guess I got out of the habit. Well, it was time to reintroduce this old favorite and see if I could make it a new family staple all over again. And me, the raw onion-hater devoured it. Well, that’s because I left them out. Unlike other salsa recipes, I wanted to make this kid-friendly. And, well, me-friendly since raw onions and jalapenos and I do not get along. There’s a little bit of spice from chili powder, a pinch of smoky cumin, and the zing of the lime just pulls everything together (and keeps the avocado from turning brown). For chopping an avocado, carefully run your knife horizontally around the avocado, slicing all the way to the pit. Then gently twist and pull the halves apart. Hit your knife into the pit and twist it out. Then you can use a spoon to scoop out the flesh in one piece and chop it. 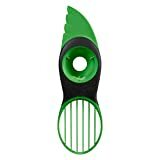 Or you can try this cool 3-in-1 avocado slicer. I like to squeeze the lime next because it helps keep the avocado from turning brown. The Double Sided Citrus Juicer you saw in the video is my favorite. 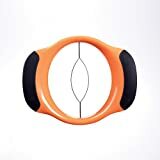 I try to avoid buying kitchen gadgets that only have a single use, but the mango slicer is a true lifesaver. I always found it difficult to neatly cut the mango flesh away from the pit. Once you’ve done it though, use a glass and position the rim of the glass at the edge where the skin meets the flesh. Slide it down to separate the flesh from the skin. Or you ca also use a peeler. The just chop it up. My kids and I are not big fans of raw onions and jalapenos, but I still want a little spice, so I use a mixture of cumin for a bit of smokiness and chili powder. You get the kick without such a strong, harsh flavor. That definitely makes this Mango Avocado Salsa more kid friendly. Some people love cilantro and some people hate it. I think it adds a great fresh flavor to this salsa recipe, but you can leave it out entirely if you prefer. 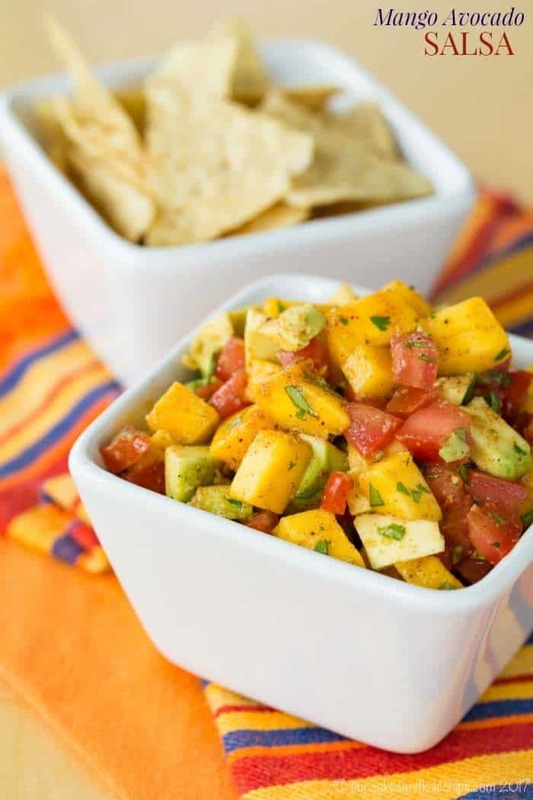 What do you eat with Mango Avocado Salsa? Spoon it on grilled chicken, stuff it into omelets or quesadillas, and of course just dip some chips. 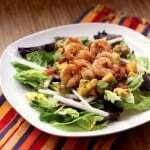 It’s also fabulous on my Fish Stick Tacos and Tropical Shrimp Salad. 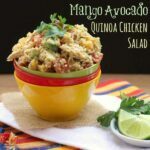 It also inspired this Mango Avocado Quinoa Chicken Salad because we just love the flavor combo so much. In fact, we love this flavor combo so much it inspired this Mango Avocado Quinoa Chicken Salad. If you’d like to try another fruit salsa recipe, my friends have plenty for you to choose from! Blueberry, Strawberry, and Jicama Salsa from Two Peas and Their Pod is fresh and fruity with a bit of crunch. Perfect for summer! Pineapple Salsa from Bless this Mess is the perfect blend of sweet and spicy. You can even serve it right out of the pineapple for a fun “bowl”. The easy Strawberry Salsa recipe from She Wears Many Hats can go from appetizers to dessert. The kids would love it as an after-school snack. And if you don’t know what fruit to choose, the Spicy Fruit Salsa from The View From Great Island is the way to go. There’s berries, grapes, citrus and more. 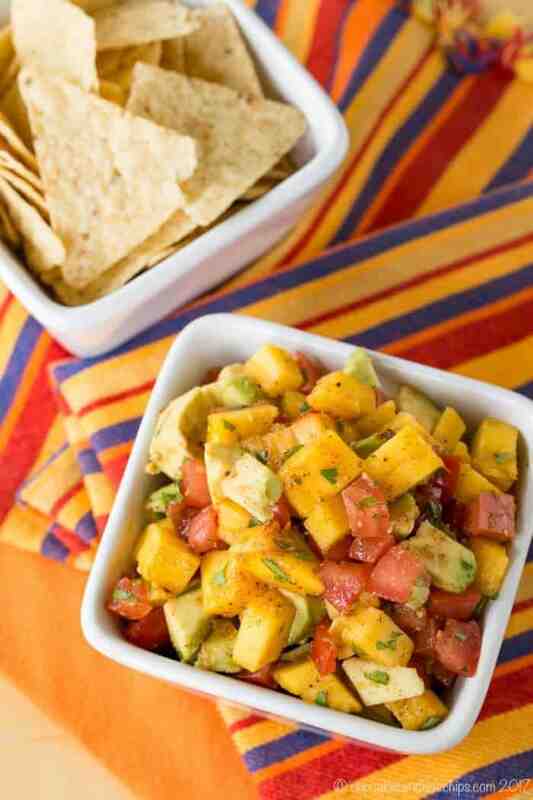 I hope you’ll try this easy, colorful, and flavorful Mango Avocado Salsa recipe. Whether you want something new for Cinco de Mayo or just want to freshen up those tacos or dinners on the grill, I guarantee you’ll be eating it all summer long, or maybe even all year long. If you love it as much as we do, please give it a 5-star rating and you can also share on Instagram and tag #cupcakesandkalechips! Combine all of the ingredients in a bowl. I like to squeeze the lime over it right after I cut the avocado to keep it from turning brown. If you have time, let it sit in the fridge for a little while to let the flavors blend before eating. 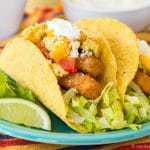 Serve on tacos, salad, grilled meats or fish, inside quesadillas or omelets, or just with chips. First published on May 24, 2012. Updated March 29, 2016. It’s almost embarrassing! WOW! This salsa is so bright and flavorful. I do not love avocado, but I am so into this salsa. Thank you for linking up at our Ladies Night Celebration . We hope you come back this week and share your favorite cocktails, appetizers and treats!!! I am a recent avocado fan – this salsa helped convert me. Made this tonight to go with our grilled fish tacos! Yummy 🙂 Wouldn’t change a thing! 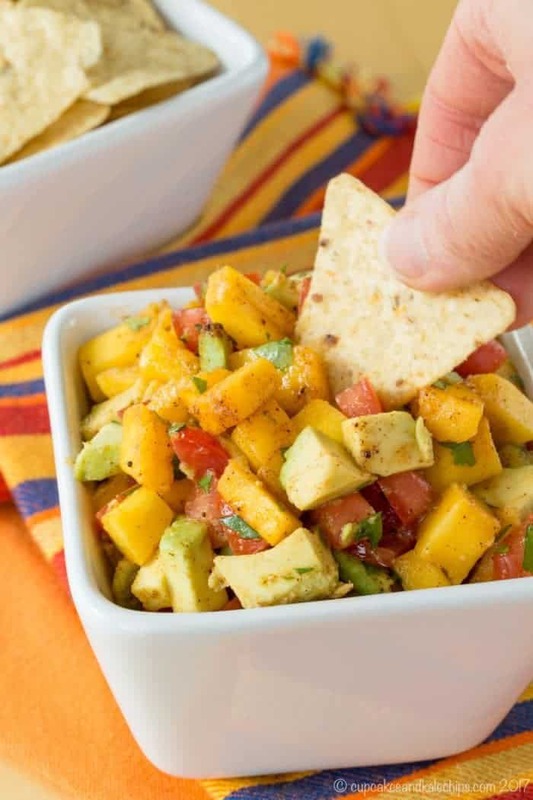 I liked the photo (s) so much I pinned it- can’t wait to try this salsa- love mango and avocado! Thanks for the pin! I hope you love it! So light for the summer. Wow- you have quite the photo gallery resume! These pics are great and I really appreciate the shout-out! I’m getting there, but thanks. I am having a lot of fun learning my way around the camera. So happy you stopped by! I hope you enjoy the salsa! I have family in Texas, so I know it gets to be brutal down there. Stay cool! Oooh, I bet the blue corn chips would be great with it. And the colors would look so pretty. I hope you enjoy! Beautiful photos and delicious looking recipe! Great confirmation that you are doing the right thing with so many “fans!” Congrats!!! Thank you! I am just trying to be myself and have fun, and if people like it, then that is awesome! Yes, it is fun to share the journey with others. Thanks!